hips, waist, and upper abdomen when applied to individuals with a BMI between 30 and 40 kg/m2. The Verjú is a multi-faceted approach to treat the appearance of cellulite, and is the only device to be backed by a level (1) placebo controlled study to prove its efficacy. The Verjú is a transdermal laser that penetrates the skin to treat hypertrophic adipocytes while increasing dermal collagen and stabilizing the fibrotic septae collagen. Laser Effects on Fat Cells. In 1998, Erchonia, along with Rodrigo Neira, a plastic surgeon from Canada, started researching the effects the Erchonia laser had on adipocytes. In 2000, Dr. Neira presented his data at the World Congress of Liposuction. Dr. Neira’s work was greeted with great skepticism. As a result, Erchonia supported three separate independent research sites from around the world to either substantiate or disprove Dr. Neira’s work. All three sites duplicated the innovative work of Dr. Neira substantiating his original data. Rodrigo Neira, M.D., Jose Arroyave, B.S.C.E., T.E.M., S.E.M., Hugo Ramierez, M.V., Clara Lucia Ortiz, M.D., Efrain Solarte, Dr. rer. nat. 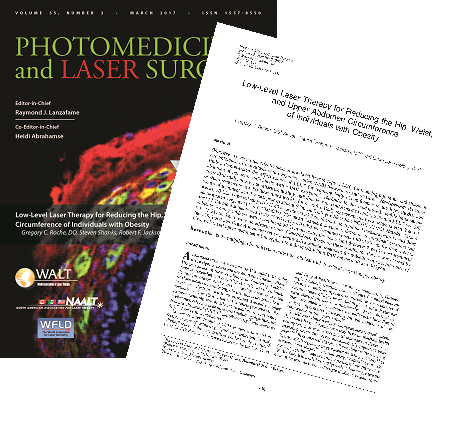 Federico Sequeda, Ph.D., and Maria Isabel Gutierrez, M.D., M.Se., Ph.D.
How far can laser penetrate abdominal subcutaneous fat? Can it affect both superficial and deep subcutaneous fat? Could laser serve as a viable tool as an adjunct to liposuction or as a standalone contouring technology? In 2001, Magnetic Resonance Imaging (MRI) showed laser therapy emulsified fat as deep as 5.0 cm, affecting both superficial and deep subcutaneous fat. In 2004, a randomized, controlled clinical trial revealed test subjects undergoing laser treatment presented with softer fat. This study led to the first and only 510(k) market clearance granted to a laser device (The Erchonia EML) as an adjunct treatment to liposuction. Although previous studies had answered important questions, one new question surfaced: Can laser therapy serve as a standalone non-invasive body contouring device? In 2008, Erchonia started to answer this question. Data from an initial pilot study produced meaningful circumferential losses from the waist, hips, and thighs in just two weeks. These data were published in Lasers in Surgery and Medicine in 2008. Erchonia recognized the potential of this application and scheduled an Investigational Device Exemption meeting with the FDA to design an appropriate clinical study. Erchonia, using the comments provided by the FDA, designed a placebo-controlled, randomized, double-blind clinical study. Additionally, subjects were required to keep a daily dietary journal, recording any departure from their normal lifestyle. If a change was documented, the subject would have been excused from the study. No diet, exercise, or supplemental program was used any time during the study. After a two-week treatment administration period, a majority of subjects exceeded the FDA’s success criterion of at least a 3.0 inch loss from the waist, hips, and thighs. The data was published in 2009 in Lasers in Surgery and Medicine.